World Water Day is a chance for us to cheer about our community (you!) and most importantly the communities we serve in Kenya, Uganda, Rwanda, Sierra Leone, South Sudan and most recently Burkina Faso. Water is something we all share. It’s a community resource. Making sure we all have access to the 1% of the earth’s water we can actually drink will always require that we work together. So, this World Water Day, we want to take a moment to celebrate how community makes that happen. Over the past few years, thousands of you rallied your own local community to help provide clean, safe water to villages in Africa. From car washes (like this one at Cashmere High in New Zealand), to bake sales, water walks, talent shows, and even teeter-tottering, you helped build a first step – access to clean, safe water. And right now, tens of thousands of people are building on that foundation. Developing communities are using their new resource everyday – not just to survive, but to thrive and work toward an even better tomorrow – just like you do. Without your voice, in your community, this wouldn’t be possible. So to better celebrate World Water Day, why not take a moment to invite someone new to the story? Head over to Facebook or Twitter and post an update about what we’re doing together. Encourage your friends to “Like” or “Follow Us“. We know that the greatest accomplishments and the most exciting new ideas made possible by our work won’t simply pour out from the tap of a new well. They’ll come from the hands and minds of the people who use it. People change everything. Clean, safe water helps make that possible. That’s why today is most importantly a chance to celebrate the amazing communities we are privileged to partner with in countries like Kenya. 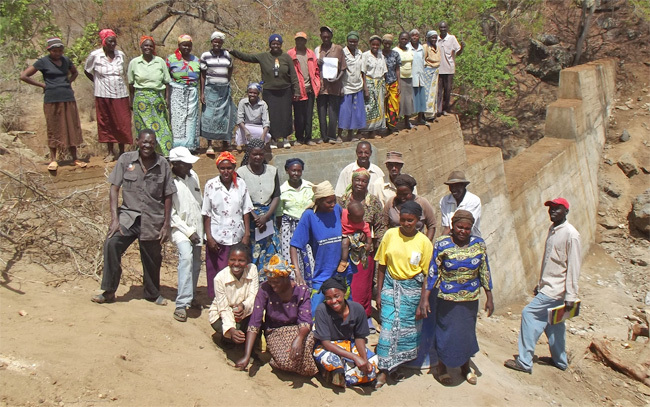 Here, TWP’s partner, The Africa Sand Dam Foundation, is working with the Kakai Self Help Group. The people of Kakai have organized themselves into a team comprised of 22 men and 18 women. This leadership team plays an integral role in mobilizing the rest of the community as they work to construct a sand dam and shallow well. 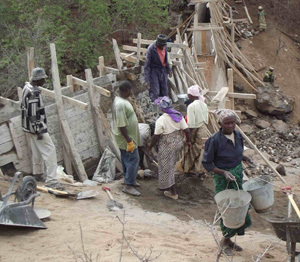 Sand dams are an amazing type of water project. And it’s why we’re really excited about our new partnership with ASDF. A sand dam traps seasonal rain behind a small dam. Over time it fills with sediment (sand) which traps water. That water can be collected for drinking, but it also raises the surrounding water table making agriculture much more sustainable. These projects help provide what is called “food security” – an assurance that what you plant you’ll be reasonably certain you can harvest. Access to water and food security can go hand and hand, and the U.N. just happens to be focused on it this World Water Day. What we love most about these projects though, is that it’s the communities who build them. From gathering stone, to mixing concrete, building forms and putting it all together – there’s work for everyone. Your support helps pay for supplies, engineers, well pumps and training. But it’s the community that makes it happen. In the end, the size of the dam and the incredible amount of water it stores is only eclipsed by the pride of ownership the community will have. 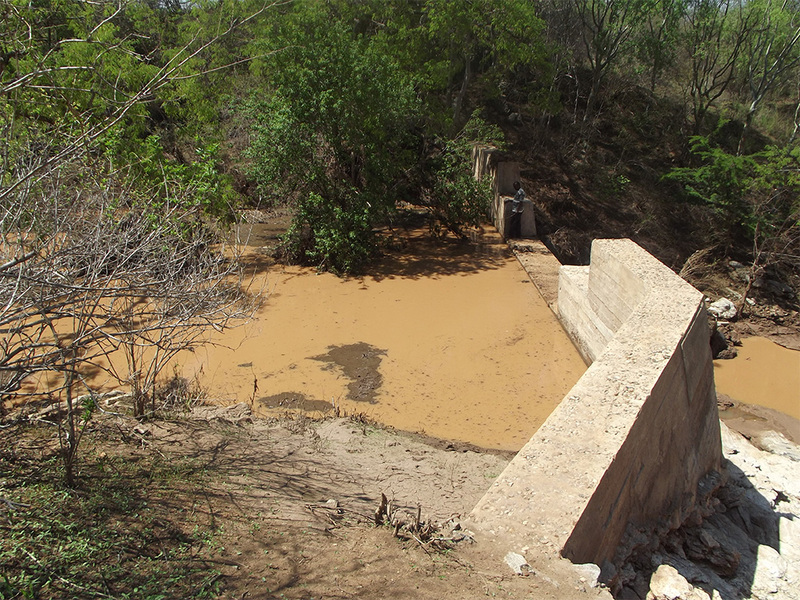 We hope you’ll watch as we work to fund another ten of these large scale sand dam projects this year. Maybe you’ll even want to join in too. Happy World Water Day!